Disgusting may be the first thing that comes to mind when you see the art of Jennifer Angus, who works with dried insects, but upon closer investigation, "amazing" is the word you're more likely to use. 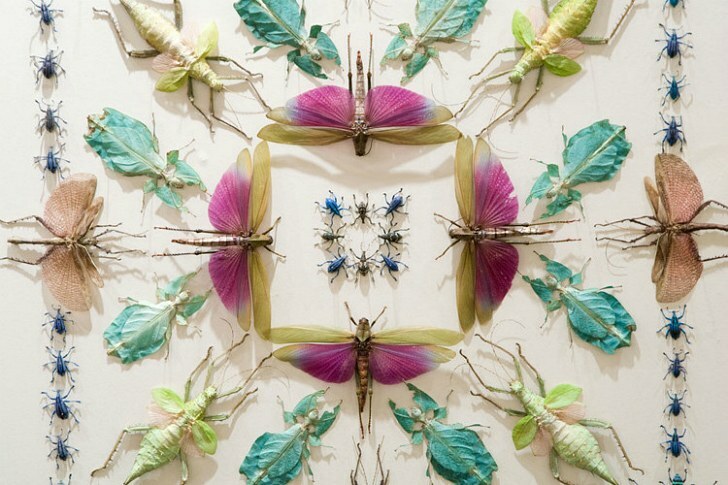 An art and design professor from the University of Wisconsin, Madison has been working with dead and dried insects for over 10 years now and arranges them in kaleidocscopic patterns for galleries and museums all over North America. With over 30,000 insects at her disposal sourced ethically from Asia, Angus is hoping to raise awareness about insects, their role in our world and the necessary protection of their habitats. The beauty of Angus’ work is not only the incredible patterns she forms with the insects, but also the insects themselves. She neither paints nor doctors them in any way, so when you see these amazing and iridescent bugs, it is truly what they look like. Like wallpaper, the installations are pinned onto vertical surfaces and often incorporate words or other elements to go along with the theme of the installation. To create the installation, Angus first creates the room layout, then uses photoshop and images of the bugs to lay out her design. When she and her team arrive at the space, they hang string in a grid and begin pinning the insects according to the map. Lately, Angus has taken to using bugs to create a Victorian-era doll house diorama. Insects have a very important role in our environment and are responsible for pollination and decay, so Angus hopes that her work sheds a better light on insects, get people excited about them and help protect their habitats. This past spring, Angus exhibited a show called Arranging Nature at the Museum of Science and Industry in Tampa, Florida. 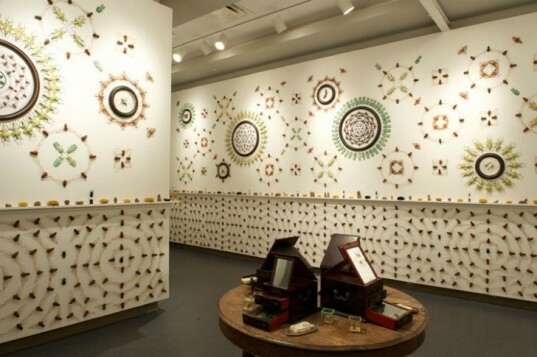 Her latest exhibition called All Creatures Great and Small features around 5,000 insects at the Craft and Folk Art Museum in Los Angeles now showing until September 11. I am horrified that an artist would be an accomplice in killing so many beautiful creatures. This is not art as I value it. Very sad. I was going to enter a show where she was the juror, but not now. "With over 30,000 insects at her disposal sourced ethically from Asia"??? --> No one can be sure about dealers' honesty, especially in countries with endemic biodiversity: no one can truly monitor how specimen are collected. Plus dealers are not the one collecting: they buy from locals who often collect and sell rare species as well when they find them. Acclaiming such an artist is totally irresponsible! And who care if they are not endangered, how can you ask for 30,000 insects in the name of Art and, what is worst, how can it even appear on a blog caring for environment? I am really chocked, this is just a call for biodiversity destruction. This is no better than stuffed animals hanging above doors in hunters' home... Same idea, same philosophy at the end. Only here, it is under the hypocrisy of calling it Art. And it isn't even the 1st piece of art of this artist... how many dead insects will she have used by the end of her life??? What if everyone was doing the same? What an outrage! And you think it's ethical? Seriously, this is the 1st time I come accross someone pretending to care for biodiversity who is actually killing it for no other purpose than art and putting it on display. This is just completely disgusting, illogical and has no place on such a blog. The beauty of Angus' work is not only the incredible patterns she forms with the insects, but also the insects themselves. She neither paints nor doctors them in any way, so when you see these amazing and iridescent bugs, this is truly what they look like. Like wallpaper, the installations are pinned onto the museum walls and often incorporate words or other elements to go along with the theme of her installation. To create the installation, Angus first creates the room layout, then uses photoshop and images of the bugs to layout her design. When she and her team arrive at the space, they hang string in a grid and begin pinning the insects according to the map. Lately, Angus has taken to using bugs to create a Victorian-era doll house diorama. Angus sources all of her bugs ethically through reputable insect specimen dealers throughout North America, Europe and Asia and none are on the endangered species list. The bugs cost anywhere from 50 cents to $25 dollars each and stores them pinned to foam to reuse them over and over again in different exhibitions. Many of the bugs that Angus sources are from Asia, collected by local people who live near the forest. Angus explains, "Everyone recognizes that forests are the lungs of the planet. We need them. One could make the argument that those harvesting insects are in fact protecting the jungle." Insects have a very important roll in our environment and are responsible for pollination and decay, so Angus hopes that her work sheds a better light on insects, get people excited about them and help protect their habitats. This past spring, Angus exhibited a show called Arranging Nature at the Museum of Science and Industry in Tampa, Florida. Her latest exhibition called All Creatures Great and Small features around 5,000 insects at the Craft and Folk Art Museum in Los Angeles now showing until September 11.